1. 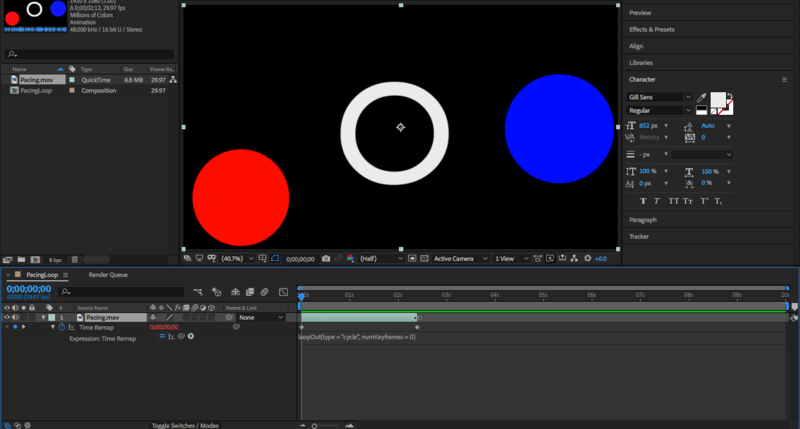 Create an initial keyframe so that you can change the position of the circle. 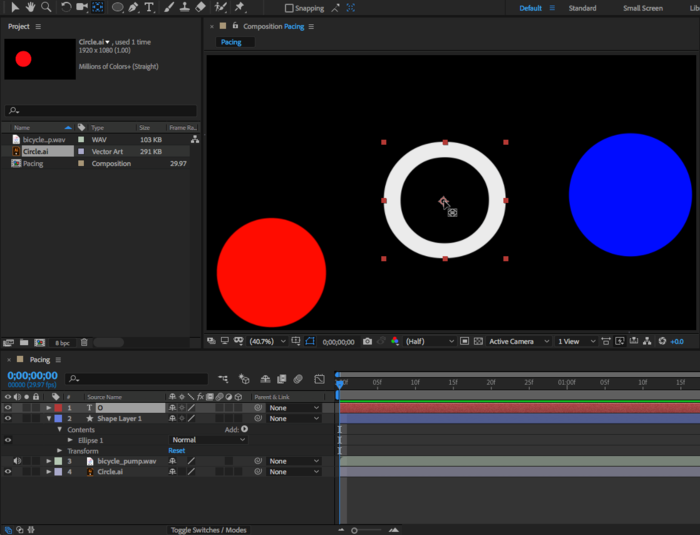 In the layers panel, click the arrow next to the “Circle.ai” layer to expand the twirl down menu. 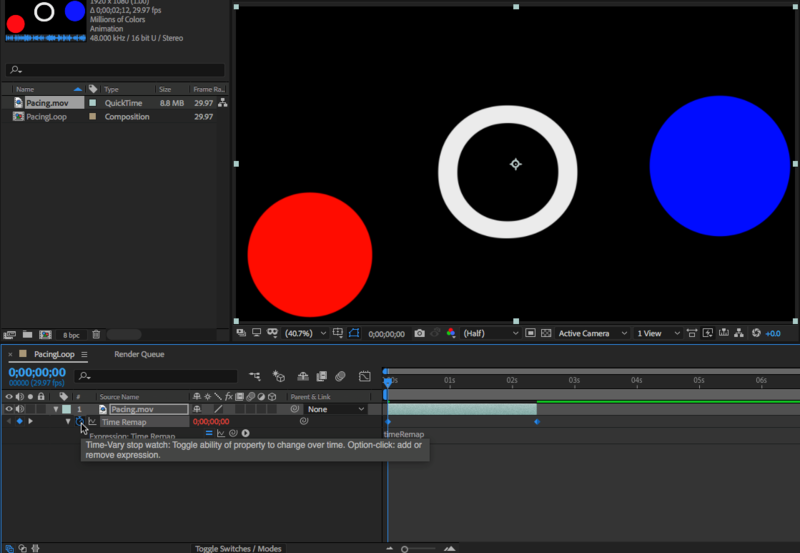 Do the same for the Transform menu, and then click the stop-watch next to Position while the playhead is at the first frame. 2. 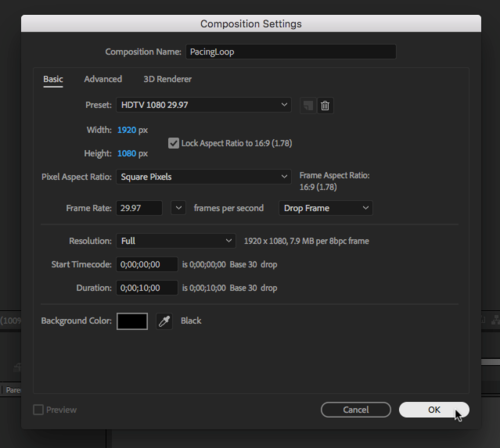 Move the playhead halfway through the composition so that it is exactly at 1:06 seconds. You can find the time at the bottom of the composition panel. Change the position of the circle so that it is higher than its previous position. 3. Move the playhead to the last frame. 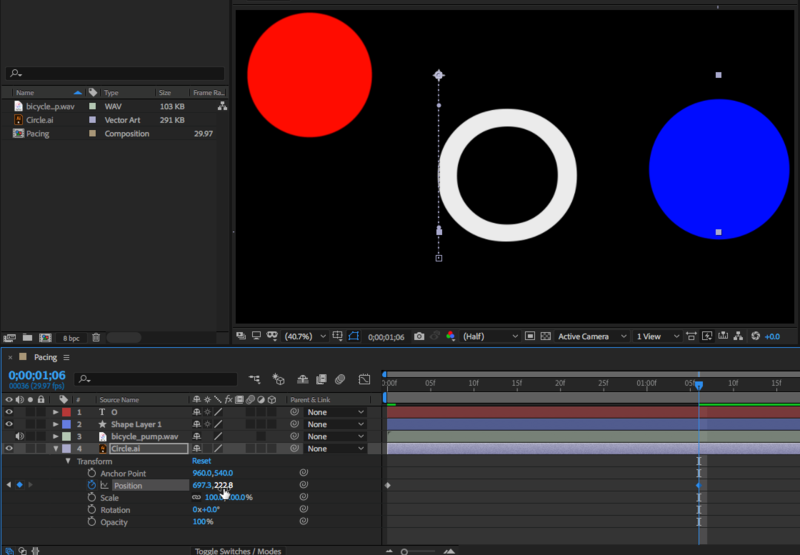 Click on the first Keyframe we made in step 1, copy it, and paste it to the last frame. 4. Press SPACE to preview. 5. 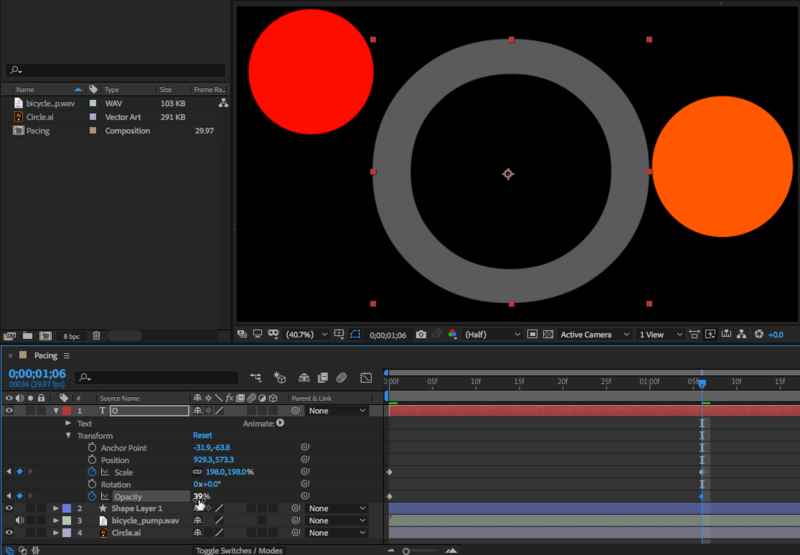 Select the solid shape and make a keyframe for Color (Contents > Ellipse 1 > Fill 1) at the first frame. 6. Move the playhead halfway (1:06) and change the Color. 7. 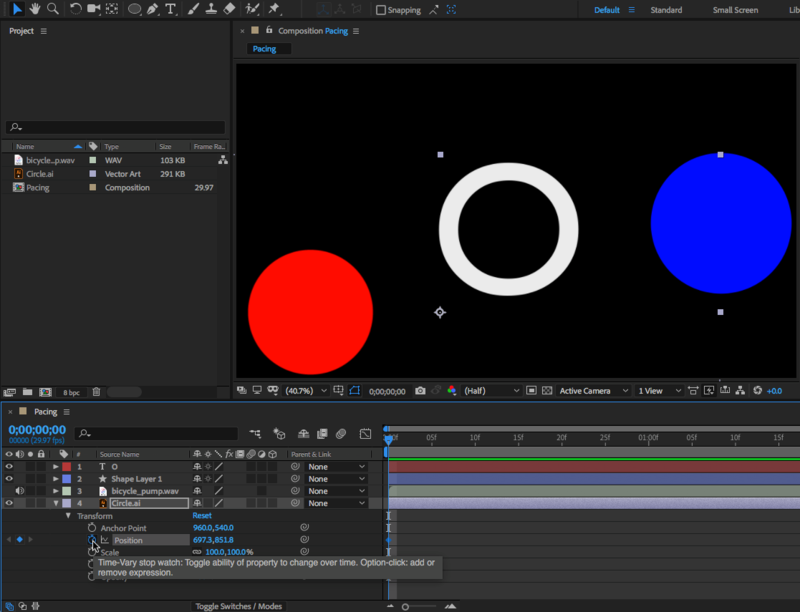 Go to the last frame and duplicate the first keyframe. 8. Press SPACE to preview. 1. 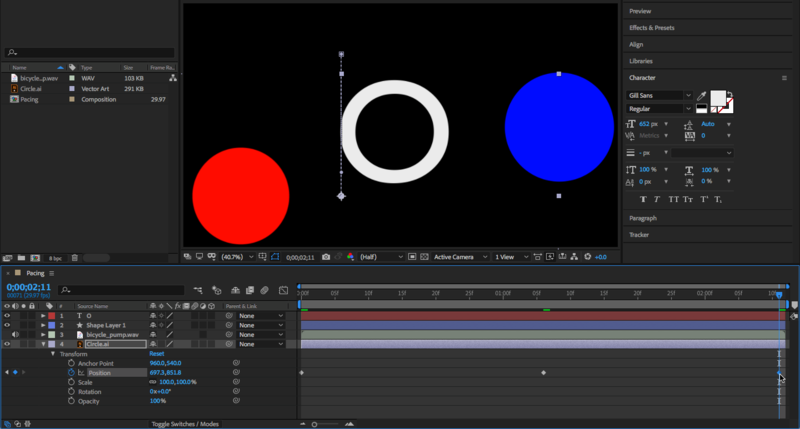 For the “O”, make a keyframe for scale and opacity at the first frame. 2. Move the playhead halfway so that it is at 1:06 seconds. 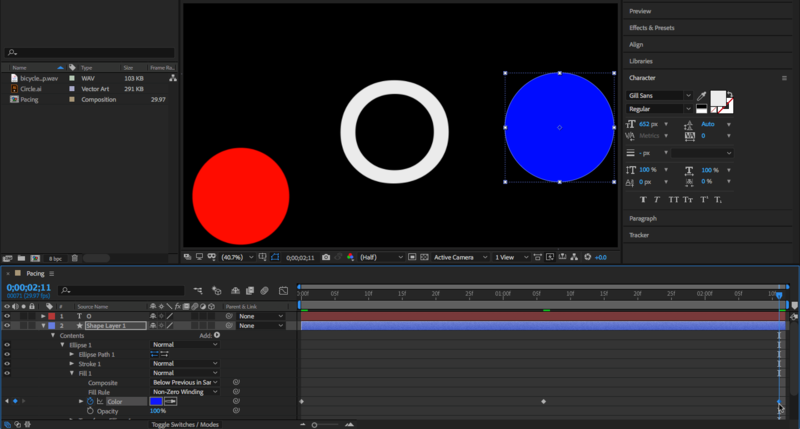 Change the scale so it is larger but not touching the other circles. Then change the Opacity to 0%. 3. 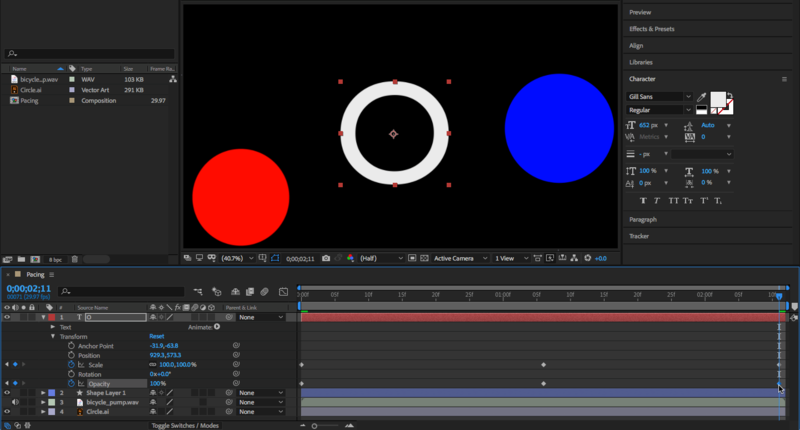 Go to the last frame and copy the key frames from the first frame to the last frame. 2. 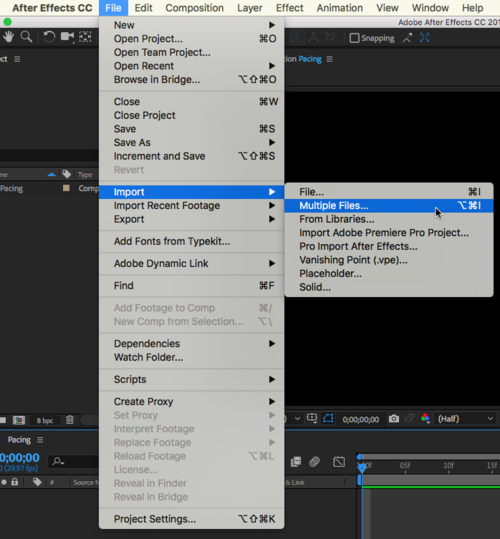 Then Export by selecting File > Export > Add to Render Queue. 3. 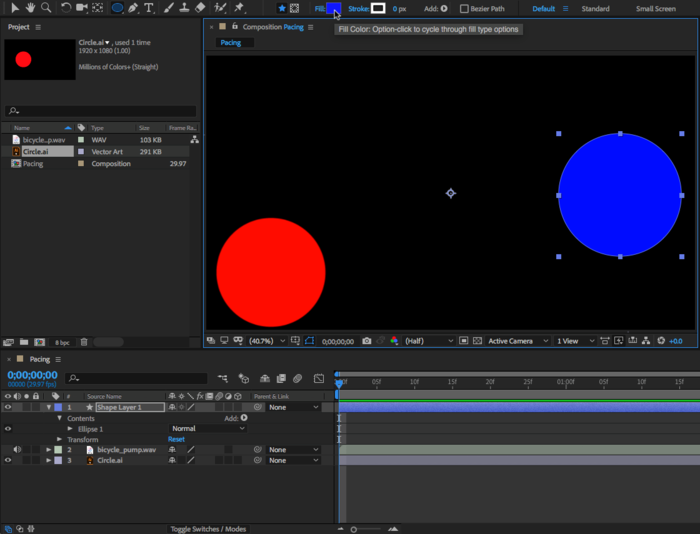 Change the value of “Output To:” by selecting the blue value and choosing where the composition will be exported to. Click save. 4. 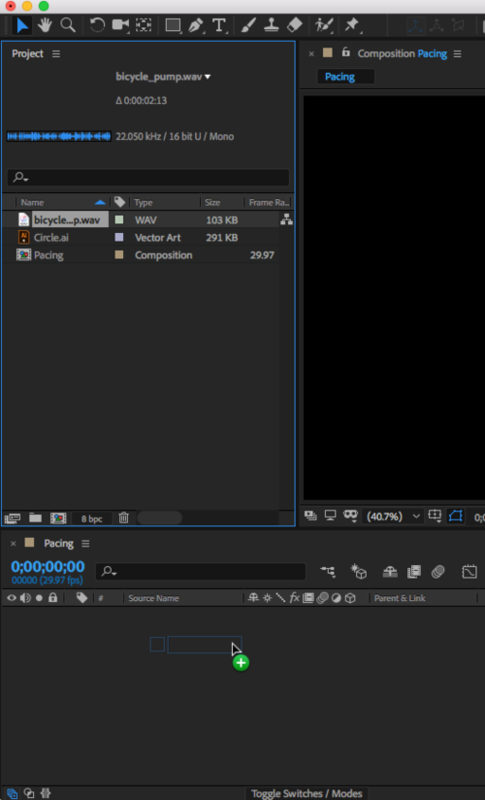 Click on Render on the right. This will export and render the video to an MOV file. 1. 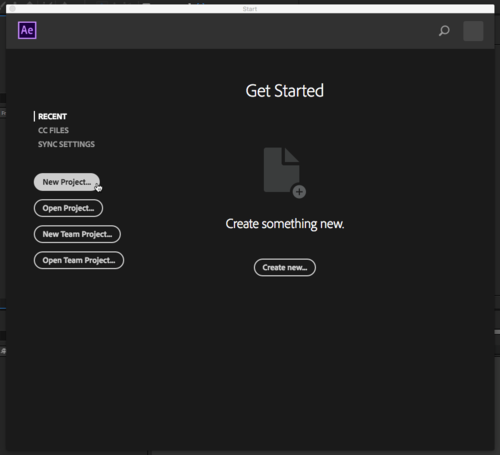 Make a new project by selecting Composition > New Composition or by using the shortcut, CMD + N.
3. 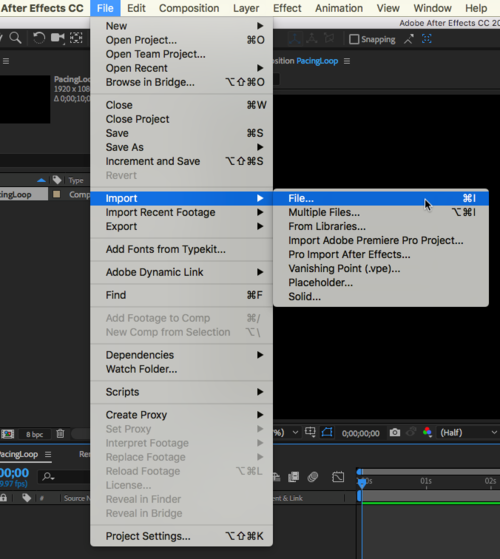 Select File > Import > File… and select the Pacing.mov file that we created earlier. 4. 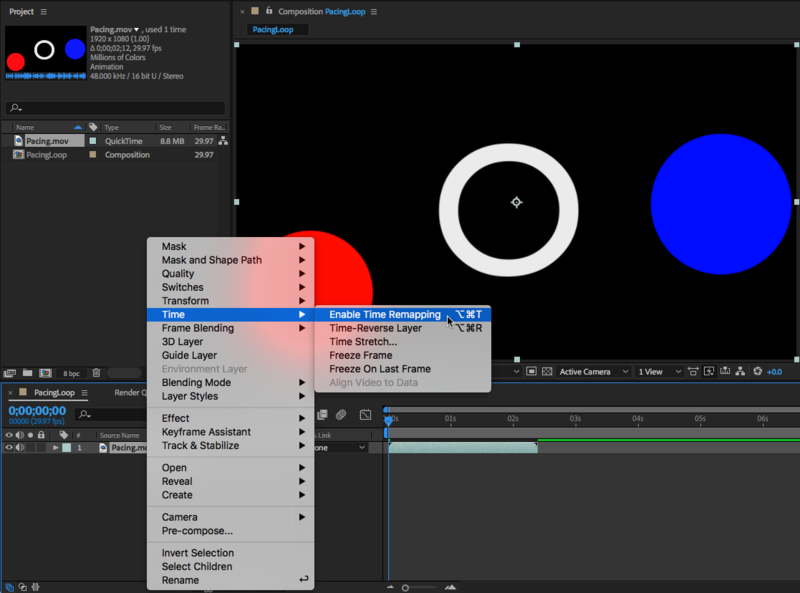 Click and drag Pacing.mov to the layers panel and press SPACE to preview. 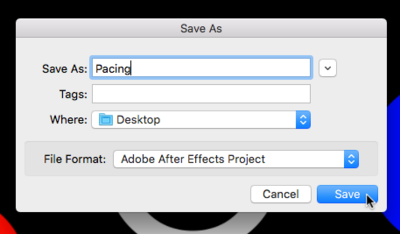 As you can see, the Pacing file only lasts for 2 seconds of our 10 seconds. 5. 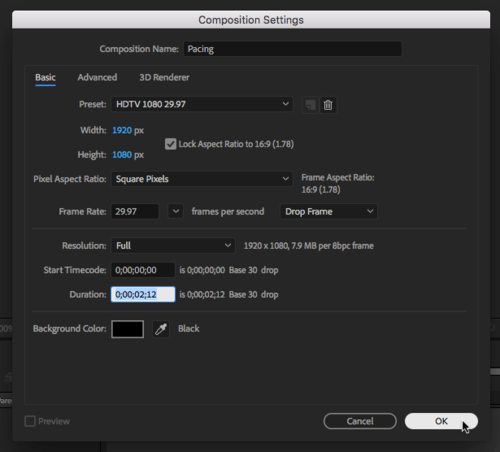 Right click the Pacing.mov layer and select Time > Enable Time Remapping. 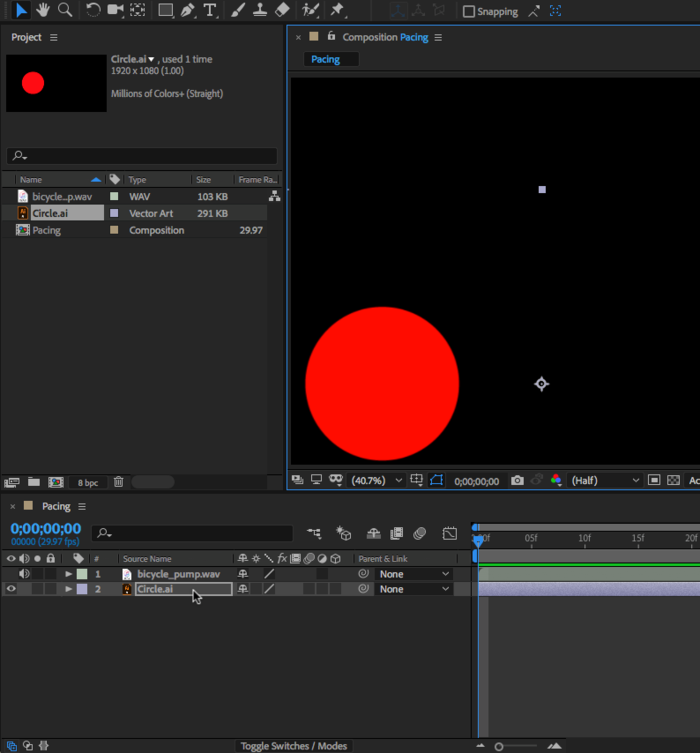 This will create a property with a keyframe under the layer. 6. 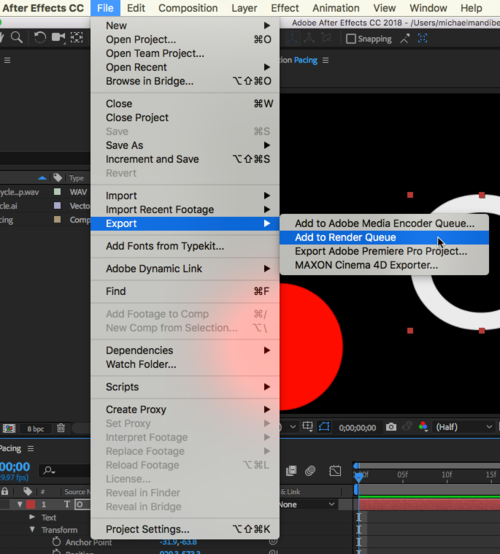 Option + Click the keyframe icon to create an expression. Expressions are bits of code that tell After Effects details about the property, in this case Time Remap. 7. 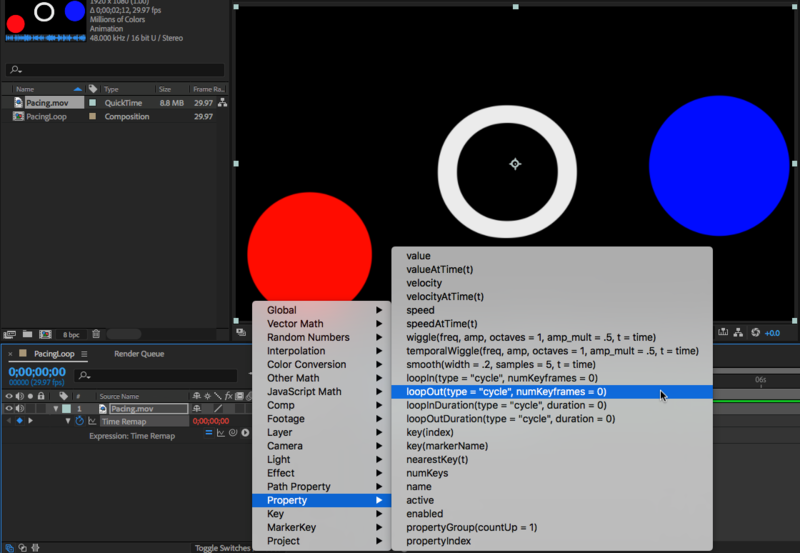 Click on the Expression Language Menu, which is the circle with the triangle within the expression layer. 9. Now drag the end of the Pacing.mov layer to the end of the composition. 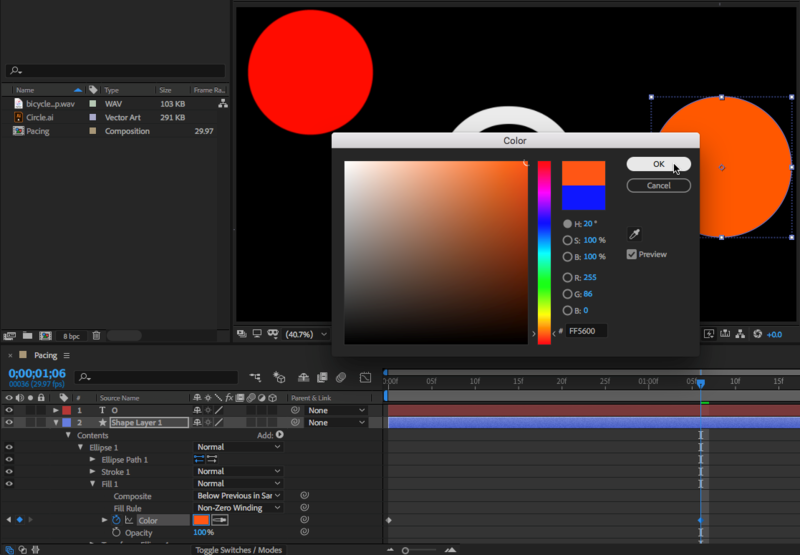 This will tell After Effects to loop until the end of the composition. 10. Press SPACE to make check that Pacing.mov is looping for the 10 seconds. 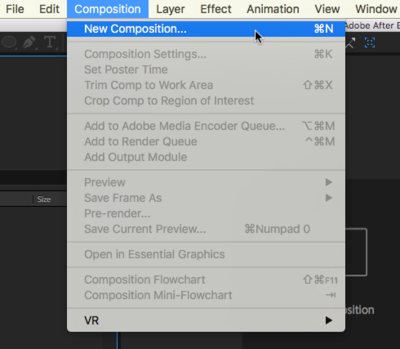 If it is, continue exporting and rendering the composition like in Exercise 5. This page was last modified on 13 December 2018, at 09:34.